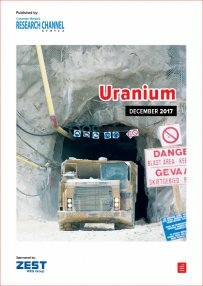 The uranium industry has continued to face challenges, as low uranium prices have persisted for the sixth consecutive year amid bear market conditions, following the Fukushima nuclear disaster, in Japan, in March 2011. The impact of this uranium market downturn has taken a toll on uranium production, with cutbacks becoming the norm as higher-priced legacy long-term contracts come to an end. Nonetheless, nuclear energy continues to expand globally, owing to its ability to deliver large amounts of reliable and constant baseload energy without carbon emissions or air pollution at competitive generating costs, compared with alternative forms of electricity. Creamer Media’s Uranium 2017 report examines the global uranium market in the context of demand, supply, pricing and market outlook, with a particular focus on the African uranium market, and the mines, projects and exploration that are under way on the continent. This report draws from material published over the past 12 months and is a summary of other sources of information published in Engineering News and Mining Weekly, as well as information available in the public domain. This report does not purport to provide an analysis of market trends. Published on: 15 December 2017.